1/10/2006 – SEE THE 2018 UPDATE Our recent report on 12-year-old Parimarjan Negi achieving a GM norm brought the realization that our records on the youngest grandmasters in history – contained on a that is copied and quoted all over the web – are hopelessly outdated. For this reason we present a new list of child prodigies and record-breaking grandmasters. Child prodigies are a well-known phenomenon in chess, which is one of the few sports or intellectual activities where children can compete with adults on equal ground (another is computer games). The great Capablanca learned the game at four, and was one of the strongest players in Cuba in his early teens. Samuel Reshevsky also started at four and was giving simultaneous exhibitions at six. Sammy Reshevsky playing Charles Jaffe at 11. He tied for third with Janowski, Bigelow and Bernstein. In recent times we have seen the record for youngest grandmaster in the history of the game topple repeatedly. In 1991 Judit Polgar, a female at that, broke Bobby Fischer's 33-year-old mark by becoming a grandmaster a month earlier than he had done. In 1994 her record was broken by fellow-Hungarian Peter Leko, who a short time later was overtaken by Ukrainian Ruslan Ponomariov. The latter went on to become FIDE world champion. 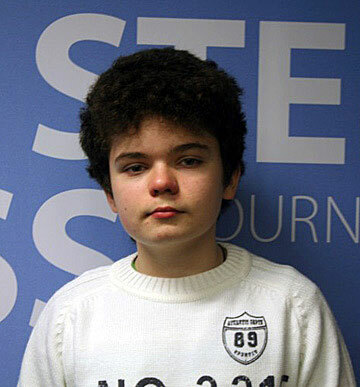 In 2001 14-year-old prodigy Teimour Radjabov, who hails from the same town as Garry Kasparov (Baku), became the second-youngest grandmaster in history. But all these records were shattered on August 20, 2002, when Sergey Karjakin (pronounced car-yack-kin) of the Ukraine fulfilled his final grandmaster norm at the age of 12 years and seven months. He did so at the international chess tournament in Sudak, a town on the Crimea Peninsula. His FIDE rating at the time was 2523. In the same year Sergey became one of the seconds of world champion Ruslan Ponomariov. This was another record he achieved before he had reached his teens. Today (January 2011) Sergey is a top grandmaster, ranked fifth in the world, with a 2776 rating that is climbing steadily. Although we must be cautious with such statements one must assume that his records will not be broken. One extraordinary chess prodigy came close. In 2004 Magnus Carlsen of Norway completed his GM norms, eight months later than Karjakin had done. Carlsen, who at 18 trained for a while with Garry Kasparov, went on to become the top-ranked player in the world, crossing the magic 2800 mark – the youngest player by far to achieve both these feats. Below we have compiled a list of the youngest grandmasters in history. In the future we may be updating this list, as new GMs under 15 years of age emerge. 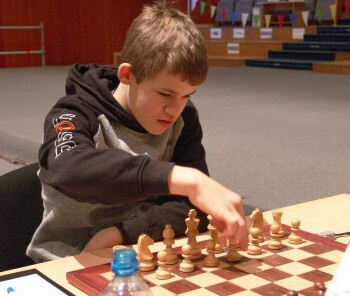 The currently (January 2011) youngest grandmaster in the world is Illya Nyzhnyk, who completed his title at the age of 14 years 3 months and 2 days. As we can see Magnus Carlsen was the highest ever rated starting from the age of fifteen. Anish Giri is the second-strongest sixteen-year-old in history, Sergey Karjakin the third strongest. From then on it is Karjakin, Maxime Vachier-Lagrave and Fabiano Caruana battling for the rank of second, third and fourth strongest 17- and 18-year-olds, with Giri and Wesley So not in contention because they have not yet reached that age. Garrett Kingman sums it up as follows: "Giri is higher rated than any 16-year-old not named Magnus Carlsen has ever been, and he is climbing faster than Carlsen was at the same age. Progressing slightly ahead of Karjakin and Radjabov, there is no question that Giri will become a permanent top ten player and world title challenger. Carlsen-Giri 2016 anyone?" It is worth mentioning that although Judit Polgar only became an official GM at 15+, she was rated a whopping 2555 at the tender age of twelve (after her unbelievable 2694 performance at the Olympiad). We also believe that she was the youngest top 100 player in history. Paul Morphy, 1837-1884, beat Johann Löwenthal 3-0 at age 12. Samuel Reshevsky, learned the rules at the age of 4, and gave simultaneous exhibitions at the age of six (see above). Viswanathan Anand became India's first International Grandmaster at 18 and went on to become the FIDE knockout world champion. Pentala Harikrishna became India's youngest grandmaster at 15. Alejandro Ramirez became a grandmaster at 15, a month earlier than Fischer. He is the first grandmaster ever in Central America. As of this writing (January 2006) Parimarjan Negi has achieved five IM norms and one GM norm. He is twelve years old. Mona Khaled achieved the WIM title and two WGM norms in 2005, when she was eleven years old. At the same time she won both the Arabian and the African Girls Junior Championship in the under 20 group in 2005, although she was the youngest player in both tournments. In July 2006 Parimarjan Negi of India completed his final GM norm to become the second-youngest grandmaster in the history of the game. On December 7th 2007 Wesley So of the Philippines made his final grandmaster norm at the age of 14 years, one month and 28 days to become the seventh youngest GM in history. James Satrapa of Canberra, Australia, provided us with the data of four additional players we had missed: Yangyi Yu of China, Le Quang Liem of Vietnam, Yaroslav Zherebukh of Ukraine and Samvel Ter-Sahakyan of Armenia. All have been duly added to our list. We welcome additions and corrections by our readers. James Satrapa sent us data which allowed us to insert Andrei Volokitin and Arkadij Naiditsch into the list. He also introduced us to the currently (July 2011) second youngest GM in the world: Daniil Dubov of Russia. Suri Vaibhav, born 8 Feb 1997, became India’s latest grandmaster when he won the Luc Open in Lille, France on April 29, 2012. With this feat he now becomes the 27th youngest grandmaster at 15 years 2 months and 21 days.